Wow! Isn’t that green up there? That isn’t food coloring. No, its spinach mixed with garbanzo beans and it is spooky good. You could serve this at a Halloween Party as “Swamp Dip”. All the kids will go nuts for it with the right marketing. Popeye was pretty good at marketing spinach except that he ate cans of spinach (which I find disgusting). In this recipe, I used frozen spinach. An entire pound was $1.50 and I like it because it is easy to work with. Spinach processors blanch spinach, or lightly boil it, before freezing to preserve the color and to kill any bacteria that might be hanging around. This lightly cooked frozen version has a bunch of nutrients and is low in calories. I like using fresh spinach for salads. What is nice about this spread is it has a mediterranean hummus thing going on but it is lighter than regular hummus because it doesn’t contain nut butter. I recently went to an AMAZING restaurant in Philly that added butter to the hummus. Man, I gotta tell you that was a treat! My spooky spread is more of an every day dip. Use it instead of mayo or on your crudites and whole wheat crackers. It would be great in a sandwich with slices of tomato. I find it very addictive which is a good thing since one serving has 7% of my daily value of iron and 21% of my daily value of vitamin A. 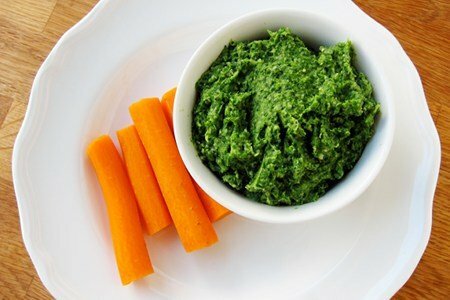 Do you have uses for frozen spinach? Please share. Thaw spinach in microwave or on stove and squeeze out the excess water. Drain and rinse garbanzo beans. Add spinach and beans to food processor with the rest of the ingredients and pulse into well blended. Serve with crudites, spread it on a sandwich, or dip crackers in it. I will be making this for the weekend, love hummus. Easy to make own and this is really healthy. Thanks for such great recipes. Do you think I could do this with frozen kale? I bought a few bags of it at Trader Joe's a few weeks ago and am now at a loss as far as what to do with them other than soup! I was thinking the same thing about the Kale. I don't think it would make a difference. I was going to try half and half first. Interesting... I don't usually like using frozen spinach because I hate wringing out that excess water. I feel like it takes forever! I love this idea! My toddler loves hummus but refuses to eat any green leafy vegetables, no matter how much I talk about getting strong from spinach, or how elephants (her favorite animals) eat leaves. Maybe this is the way to encourage her leaf eating -- blend it into something she already loves. Thanks for the idea, can't wait to try it! Love the nutmeg and spinach combo, always a winner. You can also add a little almond powder for nutty creaminess. Another great way to use frozen spinach is instead of bechamel in a lasagne dish. The green and red layers look and taste yummy. Substitute soy for meat in the tomato sauce and you are onto such a winner!